where Ts and Tinf are wall and bulk temperature, respectively. The wall temperature is easy to access, but calculation of bulk temperature needs special treatment. when bulk temperature is obtained. Go a head and calculate Nusselt. In order to calculating the Nusselt number along the pipe, it is inevitable to write some pieces of coding. The program first classifies cells in sections and then calculate the bulk temperature for each section. The code is written for OpenFOAM220, but with minor revision it can be applied to other OpenFOAM versions. 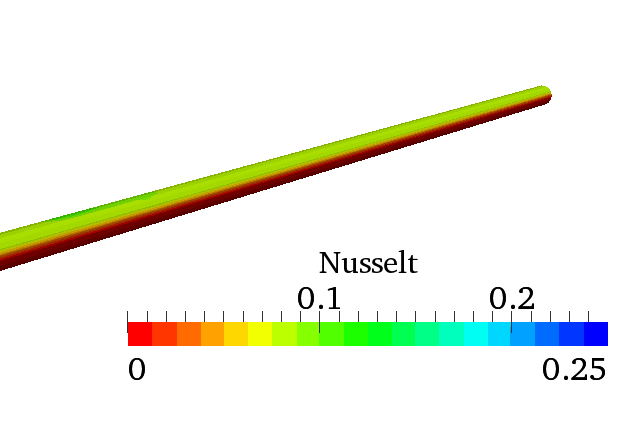 The Nusselt contour is shown in Figure 1 from present code. thank you very much for providing the source code of this program for the Nusselt number. I successfully compiled it with OpenFOAM 3.0 after minor modification. Now I am trying to understand how use it. My pipe has 3 different sections with different diameters. Can I use this code to obtain the Nusselt numbers on each pipe section? Can I indicate more that one boundary patch in the command line to get Nusselt number on different patches ? Thank you in advance for any hints on using your code. 3-define the temperature on patch for each plane.